High Build Epoxy Coatings are practical, cost effective, and attractive. For most situations we recommend that our high performance high build epoxy floors receive Wheelaborator Blastrac shotblast preparation. 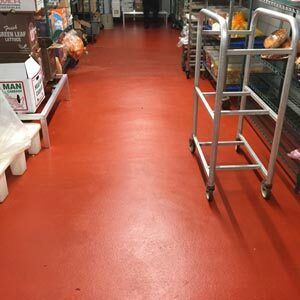 High build epoxy floor coatings are installed in thickness up to 50 mils thick (most applications range between 12-24 mils thick), and can be installed over a variety of surfaces which can include vertical surfaces. Urethane top coats are used for added chemical and abrasion resistance. Urethane top coats are used for added chemical and abrasion resistance. From basic epoxy coatings, to complex chemical resistant systems, we handle it all. 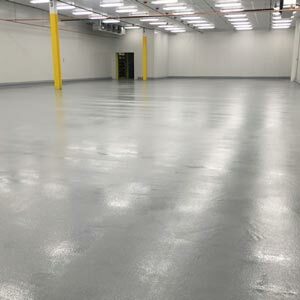 Self Leveling Epoxy Coatings are coating systems that are installed at 30, 60, and 120 mils thick. They are highly durable and easy to clean. Cry-A-Stain is a lightly pigmented or translucent coating that mimics a concrete stain but is actually a coating. Installation thickness is 32 to 48 mils (a Dur-A-Flex product). For heavy duty resurfacing look to trowel-applied epoxy resurfacers. These are a three component mortar of 100 % solids epoxy resin, catalyst, and special blended aggregates. Most installations are applied at thicknesses of 187 mils (3/16 inch) to 250 mils (1/4 inch), but can go as thick as needed. They are porous and need to have at least an epoxy coating applied as a top coat. For most situations we recommend preparation for our resurfacers are done with Wheelaborator Blastrac Shotblast equipment. 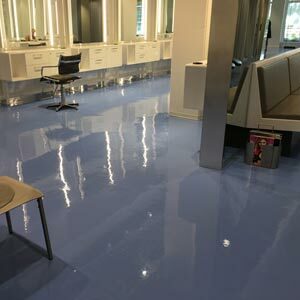 Resin rich epoxy resurfacers are a very cost effective way to resurface concrete floors. Installation thickness begins at 60 mils (1/16 inch), and goes up to 187 mils (3/16 inch) thick. These floors are non-porous, seamless, and versatile. These can be installed in a slurry or neat, with or without broadcasting aggregate into the epoxy binder. 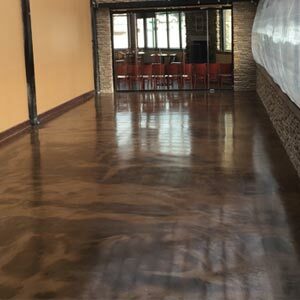 Polyurethane modified systems is a 100% solids, aromatic, cementitious urethane concrete coating system and can range from a slurry broadcast to a trowel applied mortar. These systems are best suited to deal with thermal shock. They range from 125 mils (1/8th inch) to 250 mils (1/4 inch) in thickness. This type of system cures in approximately 12 hours. Methyl Methacrylate, or MMA as it is commonly known, is a polymer flooring that uses a dry powder hardener with a liquid resin. MMA systems can range in thicknesses and a variety of colors. When using MMA systems, it is a necessity to have good and proper ventilation. Although the material has a strong odor, it has the ability to cure within an hour at very low temperatures. Epoxy Quartz Flooring is a combination of clear epoxy binders with colored quartz aggregate. These floors are installed at thicknesses of 60 mils (1/16th inch) up to 250 mils (1/4 inch) with industrial resurfacers. Available in 3 basic textures: Standard, Medium, and Smooth, these floors are seamless, non-porous, and extremely versatile. This system may include a vertical coved base. Flake Filled Flooring comes in two styles; full flake and random flake. These floors are installed at thicknesses of 16 mils to 50 mils. Two textures are available: smooth and medium. 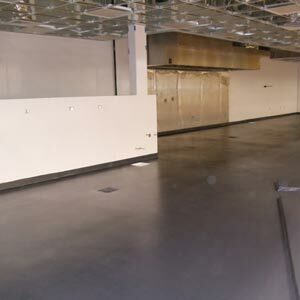 Offered for all above systems, is a chemical resistant urethane top coat for added chemical resistance when needed. Decroc is a combination of Estes DecRoc aggregate and Neogard clear epoxy binder. These floors are installed at thicknesses of 321 mils (5/16 inch) to 384 mils (3/8 Inch). These floors are porous and are available in one standard texture. We also offer a decorative troweled epoxy flooring that resembles terrazzo flooring. This is installed at 250 mils (1/4 inch) thick. 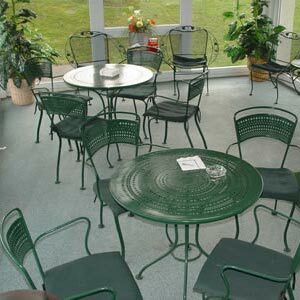 Cryl-A-Stain is a lightly pigmented or translucent coating that mimics a concrete stain but is actually a coating. Installation thickness is 32 to 48 mils.